Start driving your amazing monster truck through this great jungle full of obstacles. You have a big gun in the front of your vehicle to shoot some obstacles and get them out of the way. Others, on the other hand, you must pass them using your driving ability. Do not do too much damage to your vehicle or it may end up destroyed before you finish the level. If that happens, you must start from the beginning, trying not to make the same mistakes as in the previous round. Use the arrow keys to move, the keys W and S to move the barrel and the D key to shoot. 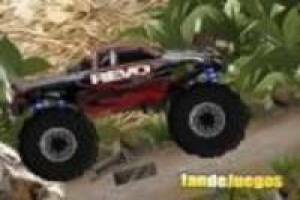 Have fun with Monster Truck Jungle, a game in which you' ll play your life. Enjoy the game Monster truck jungle, it's free, it's one of our adventures games we've selected.